The mixture of ever-increasing computing power, storage capacity and machine learning is enabling new, holistic security solutions for enterprise contact centers and customer support channels. Pindrop has leveraged it’s extensive access to hundreds of millions of calls per year via its anti-fraud solution and Phoneprinting™ technology to deliver their latest Deep Voice™ biometric engine, enabling the next generation of multi-layered security, intelligent authentication, and cross-platform identity. 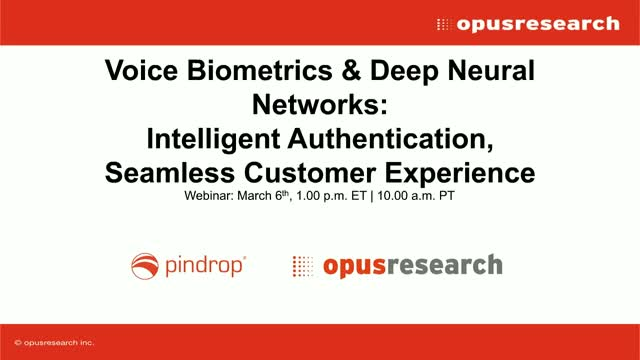 In this webinar, join Opus Research and Pindrop to learn how Pindrop’s proprietary Deep Voice biometric technology marries Deep Neural Networks and Voice Biometrics to overcome the cumbersome processes involved with enrollment, verification accuracy and fraud prevention to help contact centers deliver rich, natural, and secure voice experiences. Recent technology advancements in speech analytics technology solutions enable businesses to listen, decipher and act on every customer conversation. These conversations can turned into actionable insights affecting a business’s bottom line. In this webcast, Opus Research and Daisee discuss conversational middleware and how speech analytics solutions can be effective and flexible to help understand the meaning and context of customer conversations to surface insight and make business recommendations. Businesses are moving their “bot strategy” from vision to reality at unprecedented speeds. New tools and platforms to build bots and intelligent assistants create an illusion that anyone can setup automated assistance that will deliver real business value. In this webcast, learn practical insights from real-world, successful deployments that highlight the importance of combining high quality tools with key strategies and approaches that businesses should keep in mind. As businesses of all sizes investigate how and why to introduce “Conversational AI”, Dan Miller, lead analyst at Opus Research, joins Callan Schebella, chief executive officer of Inference Solutions, to explain why Natural Language will shape the future of Conversational Commerce. A recent survey by Opus Research shows how speech analytics is seen as a powerful tool for quality management and agent training in contact centers. It also showed that forward-looking businesses and business process outsourcers expect to integrate analytics with elements of Artificial Intelligence to support an entirely new category of solutions for “Conversational Service Automation." By incorporating the latest advances in machine learning techniques combined with voice biometrics used for caller authentication, contact centers now have the ability to expose previously unsuspected fraudulent intent. In the ongoing response to sophisticated fraud attacks, the creation of high-quality fraudster watchlists from historical recordings not only provides a highly effective defence, but also an improved ability to prosecute fraudsters. Removing these ‘bad actors’ from the picture is a revolution in the fight against fraud. With access to mountains of data — scoured, analyzed, and made actionable thanks to Artificial Intelligence, machine learning, and neural networking — enterprise organizations are staking their claim on seamless, context-aware customer interactions as a business differentiator. Altogether these technologies help deliver on the promise of secure, personalized digital self-service and can have a demonstrable impact on an enterprise’s bottom line. Indeed “zero-effort authentication” enables intelligent automation, reduced customer effort (no more PINs and passwords), reduced call handling time, and improved confidence in security. Enterprises are building zero-effort authentication strategies for maximum return on investment and increased customer loyalty. In an upcoming webinar, Ravin Sanjith (Intelligent Authentication, Opus Research) and Alexey Khritov (CEO, IDRnD) will discuss how voice biometrics, combined with AI techniques, sensors and increased processing power, can provide a virtuous cycle for greater convenience and less effort to validate a consumer’s identity in mobile apps, on messaging platforms, and beyond. The ‘mobile first’ movement has resulted in most UX investments being focused on smartphones, tablets, smart home devices, etc. However, the faithful computer and laptop continues to be the workhorse of the masses and is where the most demanding and high-security tasks are performed. So why is it that there are no user-friendly and secure solutions for authenticating into computers and laptops? The insecurity of passwords is a UX problem, and shortcuts to make them easier lead to security risks, which lead to breaches. Most of the much-publicized mega-data breaches the past few years have been because of compromised or stolen passwords. According to the 2017 Verizon Data Breach Incident Report, faulty passwords were responsible for 63% of all confirmed data breaches between 2016 and 2017. Finally, the combination of sensor-rich smartphones and biometric authentication are making it possible to eliminate passwords entirely. Using Veridium’s solutions, the challenges of unlocking and logging into a workstation have been overcome. In this webinar, you will enter a world that has continuous seamless logins with little friction. That world is being made possible through Veridium’s disruptive approach to authentication. In its third year, Opus Research unveils key findings from a global survey 500 of contact center and customer experience decision-makers regarding their criteria for evaluating and deploying Speech Analytics platforms and services. This global tracking study documents changes in the perceived value of Speech Analytics on contact center operations, workforce optimization, customer experience and business insights. Join Derek Top (Director of Research) and Dan Miller (Lead Analyst & Founder) with Opus Research, along with Samith Ramachandran (VP, Products, Uniphore), as they discuss the findings from this global tracking story and its implications for enterprise customer care strategies. Brands in every industry and geography feel an urgency to meet the conversational needs of their customers. Executives walk the fiscal tightrope between exceptional customer experiences and operational efficiency. Today’s contact center, as the communications hub for customers, is caught in the middle of the battle. Customers value fast, frictionless convenience; executives must invest accordingly. In the second year of a global tracking study, Opus Research presents findings from a survey of 500 business decision-makers to understand their perspectives in evaluating and deploying Speech Analytics platforms and services. This study, commissioned by Uniphore, documents critical datapoints in the perceived value of Speech Analytics and its impact on contact center operations, compliance and regulation, workforce optimization, customer experience and delivering a return on investment. Attendees to this webinar will receive a complimentary copy of the report “Executive Survey: Drivers for Deploying Speech Analytics (2017 Edition)." On Wednesday, November 8th (8:30 PM IST | 11 AM EST | 8 AM PST), join Dan Miller, lead analyst & founder at Opus Research, Derek Top, director of research with Opus Research, and representatives from Uniphore, as they unveil the key findings from this definitive report on speech analytics. With ever-mounting pressure on customer experience, marketing and contact center professionals to deliver and chatbots and virtual agents, deploying an enterprise intelligent assistant requires a comprehensive business plan and deployment strategy. Biometrics are proving to be a superior way to authenticate and make digital financial services more secure, but organizational implementations are lagging. As biometrics are more widely adopted by consumers for financial and non-financial use cases, banks are challenged to match higher user experience standards. As financial service companies battle to build customer loyalty and increase security in the age of FinTech, providing efficient, secure and personal services is a source of competitive advantage. The rapid growth of voice biometrics authentication demonstrates it is a convenient and secure way to authenticate real customers, detect impostors and prevent fraud. In this webinar, join Interactions and Opus Research as they describe the steps that financial service companies should take to incorporate voice biometrics authentication into the customer care experience. With ever-mounting pressure on customer service, customer experience and digital transformation executives to deliver self-service and automation strategies, some providers claim to have a “magic box” solution with AI and machine learning-fueled chatbot technologies. But, in reality, building an intelligent assistance strategy is not always so simple. In this webinar, Opus Research and representatives from CX Company, will demystify what AI and machine learning means for your organization and identify key steps in building an intelligent assistance strategy to deliver cost savings and a better customer experience. In a recent survey commissioned by Uniphore, Opus Research asked 500 influential executives in the contact center and customer experience domain about the perceived value of Speech Analytics and to ascertain the impact on plans to procure and deploy such resources in the future. With completed interviews of decision-makers (Director, VP, C-level) from firms with revenue of more than U.S. $50 million, the survey respondents included a mix of vertical industries, including: telecommunications, healthcare, financial services, retail, pharmaceuticals, travel & tourism, and commercial banking. As digital, mobile commerce crescendos, Identity and Access Management (IAM) techniques are key to providing a consistent, individualized experience, regardless of the device used or communications channel employed. Providing secure access from a trusted device was hard enough. Now customers control their device-of-choice, channel-of-choice and time-of-choice. It is important to develop and employ technologies that make authentication friction-free and pleasant. Join Dan Miller, lead analyst at Opus Research, and Brandon Whichard, from IBM Security, as they provide “Five Concrete Steps” toward keeping each customer happy. Opus Research has coined the term “Intelligent Authentication” (IAuth) to describe simple, secure and seamless ways to authenticate individuals and support digital commerce. More than 8 out of 10 customers are moving from one channel to another to complete a transaction or get an issue resolved. And, on average, they use more than 4 different “channels” over the course of their respective journeys. Despite this, customers expect consistent answers and personalized service regardless of their channel preference, device of choice and time of day. Join Dan Miller, Lead Analyst at Opus Research, and Daniel Hong, Sr. Director of Product Marketing and Strategy at 7 as they review these recent findings and their impact your self-service and assisted service strategies via text, chat, Web forms or phone calls. Dan will bring context from a recent study of Enterprise Intelligent Assistants (EIAs), culminating in the “8 Attributes of Successful EIAs”. Daniel will review primary research findings addressing both practices and preferences of customers in a digital, omnichannel world. The webinar will also include a case study. FinUno will present how an Intelligent Assistant can help users buy and sell investment products, follow market moves and manage their investment transactions in real-time simply by asking. Through its intuitive interface, the fin1™ platform acts both as a self-servicing tool and as a collaboration platform with financial advisors. No longer are voice biometrics tentatively tested in single channels and measured against purely theoretical equal error rates. In reality, businesses are implementing high performance solutions that easily scale, yet deliver a consistently low friction user experience and strong security across a business. In this webinar, Dan Miller, lead analyst and founder of Opus Research, joins ValidSoft’s VP for North America, Shawn Edmunds, and Image Ware System’s CTO and VP David Harding to discuss how successful integration of highly optimized voice biometrics has never been easier or more cost effective for your business. News, information, and exclusive research detailing Intelligent Assistants, Intelligent Authentication Conversational Commerce and voice biometrics -- Webcasts include in-depth analysis of market forecasts, real case studies, and proven business models.